Before you start a training course to become a professional pilot, you’ll be asked to go through an assessment process. This is to make sure that you have the basic skills and right attitude before you spend a lot of money, or the flight school spends a lot of effort trying to train you. It might seem a bit unfair, given that it’s your dream career, but better to find out at the start than halfway through that it’s not really for you. That said, you can and should prepare for the assessment. There’s the obvious stuff like sharpening your maths skills, understanding relevant areas of science, working on your hand-eye coordination and understanding what an airline pilot actually does. But there are other areas too, such as personality and social skills. That’s where professional assessment preparation can help and one company that’s been in the business across many fields is Symbiotics, who will be exhibiting at Pilot Careers Live London on 6 April 2019. Symbiotics is running the first of its new Assessment Preparation Days, at Buckinghamshire New University on 23, 24 and 25 April. 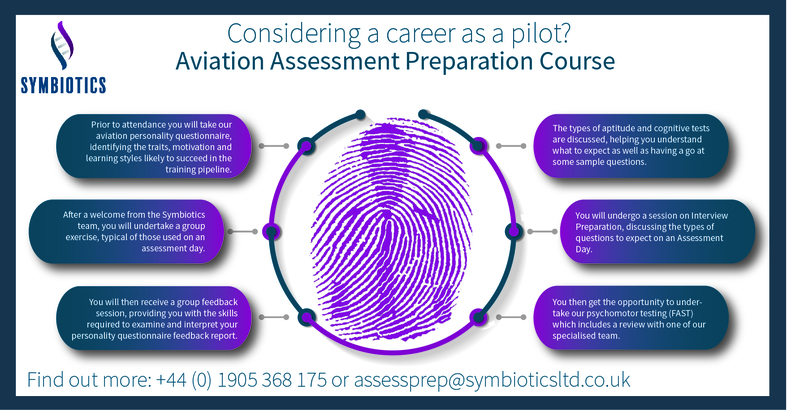 “These assessment preparation courses are designed to be vendor-neutral and be suitable for candidates no matter what the entry route into the industry; be that through a training organisation, commercial airline or university,” said a Symbiotics spokesperson. “Each course has been put together to allow you develop a full understanding of your strengths as well as identifying some areas for you to improve upon to help increase your chances of success. “The course includes an aviation personality questionnaire and psychomotor skills test. You will start to understand the traits, motivations and learning styles which are integral to you whilst learning about how these match with the requirements for the training pipeline. “You will be guided through the types of aptitude testing to expect on an aviation selection day, as well as undertaking a few sample questions. The Symbiotics Assessment Preparation Day costs £395 (inc VAT). To find out more or to book on one of these courses, please contact assessprep@symbioticsltd.co.uk or call +44 (0) 1905 368 175.